“Alexa: What’s the news today?” That depends. If a consumer wants to get news from a voice assistant such as Amazon Echo or Google Home (or the hundreds of devices that support them), the process isn’t always easy and the results are inconsistent. People have complained that the news reports on voice assistants are too long, or don’t answer questions accurately, according to a recent Reuters Institute report. But the devices aren’t going away. 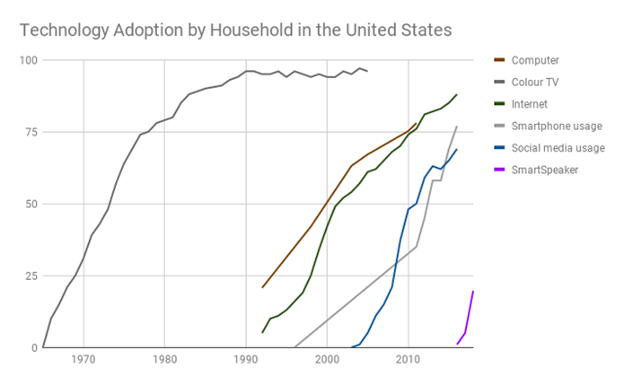 In fact, they are multiplying like rabbits, if last week’s Consumer Electronics Show (CES) was any indication, with more voice assistants in U.S. households and more of them built into other “smart home” devices such as refrigerators, mirrors, home security and yes, “Intelligent Toilets” (“Alexa, flush!”). So: What should publishers do? Experiments so far have been mixed, but that doesn’t mean giving up is an option. Instead, publishers need to fight to get better deals for content. They also need consider new types of business models such as product placement, as Meredith is doing. If you want to understand how big the voice wars have become between Amazon and Google, you just need to go to Las Vegas for the Consumer Electronics Show. Last year, Google was the upstart taking on the incumbent at Amazon. This year’s battle was more evenly matched. Google plastered ads all over town and even had an “It’s a Small World” Disney-style ride as part of its booth. Amazon opted for a lower key approach with “Works with Alexa” tags on all the associated products. Amazon touted selling more than 100 million Alexa devices. But Google shot back by saying it had 1 billion devices with Google Assistant – though that includes all Android phones sold with it built-in. While CNET had its writers decide who won the Amazon vs. Google voice war at CES (Google got the nod), the real question is how can publishers use this battle to their advantage? Will the tech companies ever give more credence to news and information on voice assistants, and what will that value be in the long run? Before we answer, we first need to understand how people are using voice assistants in their everyday life. People typically use these omnipresent devices in the morning and evening. And people mostly want them to play music, answer general questions and get weather updates. In an analysis of the Reuters Institute report, Nieman Lab’s Laura Hazard Owen noted that people love using smart speakers, but not really for news. Even though 42% said they used smart speakers for news, only 1% said news was the most important feature for them. Users also have a lot of complaints about news on voice assistants: The updates were too long, they aren’t updated enough, many use synthesized voices to read the news, and there’s no way to skip or select stories. Even worse, when people asked specific questions related to news stories, the answers were inaccurate and inconsistent. While people do use the devices to stream live radio (19% of all NPR online listening happens on smart speakers), they aren’t keen to listen to longer form audio or podcasts. Maybe that’s just a factor of podcasts being an on-the-go commuting format, while smart speakers are in the home. In the wake of Reuters Institute study and many experiments by publishers, how can they better reach consumers via voice assistants? As with all new formats, publishers must understand how people use the devices and tailor their content appropriately. The New York Times announced a new briefing for Alexa-enabled devices based on “The Daily” podcast. It is in a much shorter format for smart speakers and they are promoting it through the print edition of the paper. The Times has developed a weekly News Quiz taking into account the popularity of trivia quizzes on the devices. Meanwhile, Meredith announced its new Innovation Group at CES. The new division includes a Voice Network that brings together all of the company’s audio, voice, and podcast products under one umbrella. Meredith has experimented with “content-to-audio” where someone reads story content. However, what’s most interesting is their initiative to create skills or actions for smart speakers. One example would be using Alexa to open an AllRecipes skill with an option to order ingredients for a recipe. “The skills are actually the best place to do the product placement and direct links to commerce,” Meredith’s head of innovation Corbin de Rubertis told Folio. Publishers are still feeling their way to what works best on voice assistants. (And the payoff is difficult to envision right now.) However, growing use of these proliferating devices means that publishers can’t dismiss them. Instead, they need to start with shorter briefings, try out some new interactive skills, and as the platforms become more mature. And perhaps they can even get compensation for offering the most up-to-date relevant answers for users. Voice technologies are hot right now. Consumers are increasingly using voice-driven services on smartphones and smart speakers, which is changing the way content is sought out and consumed. This escalating trend has clear implications for marketers, content creators, and consumers. Here’s how this market is evolving and what it means for media companies. Nearly ubiquitous smartphone adoption has created opportunities for a plethora of new products and services, including those driven by voice. Perhaps the best known of these are personal digital assistants like Siri, which was introduced by Apple in 2011. It was followed by Alexa (Amazon) and Cortana (Microsoft) in 2014, and Google Assistant in 2017. Today, nearly half of US adults (46%) use these tools. And as voice recognition programs become more accurate, they are impacting online search habits. In 2016, Google reported that 20% of searches on Android were already being made using voice. GlobalWebIndex also observed that, in the 34 markets it covered, 25% of those aged 16-24 had used voice search on their mobile in the past month. 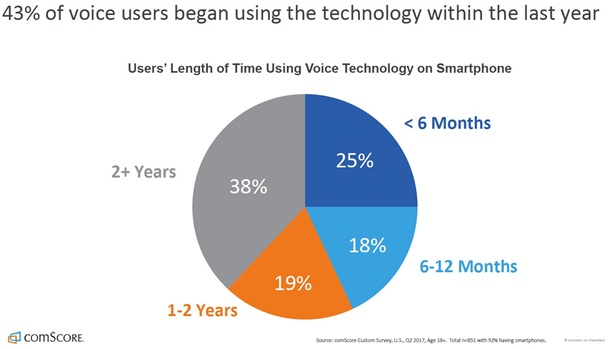 In fact, by 2020, comScore predicts that half of all searches will be conducted by voice. Smart speakers are one of the top consumer tech trends right now. The 2018 Digital News Report, produced by the Reuters Institute for the Study of Journalism, found that in major markets such as the US, UK, and Germany, usage of these products had more than doubled over the past year. Question: Which, if any, of the following devices do you ever use (for any purpose)? Base: Total 2017-18 sample in each market. Source: Digital News Report 2018, Reuters Institute. A March 2018 study from Voicebot.ai and the voice app company, PullString, found that “19.7% of US adults [about 47.3 million] have access to smart speakers today. That is up from less than 1% of the population just two years ago.” By 2022, according to Forrester Research, 50% of US households will have a smart speaker. The rapid adoption of voice technologies – from voice search to smart speakers – is noteworthy, especially when benchmarked against the take-up of many other more established technologies. Reasons for this include the ability to use the technology while doing something else (multi-tasking), the fact that people speak more quickly than they can type (speed), and increasingly “human” interfaces. Indeed, “People perceive the devices as more than just an electronic toy.” Google found that “they’re more akin to another person or a friend.” In 2017 research with over 1,600 users of voice-activated speakers, 41% said that using the technology feels like they’re “talking to a friend of another person.” All of these traits are only going to grow as these technologies continue to evolve and improve. On smart speakers, as Trustpilot’s Jason Barnard and Chee Lo have explained, there’s a further consideration. Unlike traditional search engine results on desktop or mobile, where you get a range of options, voice searches tend to be highly specific and typically result in a single response. To date, most activity on smart speakers tends to be functional. Consumers typically ask for a weather updates, jokes, or travel directions. consumption of news content and podcast playback typically fall much lower on the list. But that doesn’t mean that publishers and media companies are not experimenting with content and new interactive formats for these platforms. Publishers from NPR to Reuters, the New York Times and CNN, as well as local news providers such as the Tennessean, IndyStar, and Texas Tribune, are all creating short audio briefings designed to be heard on smart speakers. Apple’s new HomePod will feature content from the Washington Post by default. These examples show how international, national, and local players across the media spectrum are experimenting with content being heard through smart speakers. Although this functionality perhaps lends itself more naturally to other products (Malmad highlighted an advert featuring a couple placing their usual Starbucks order through the Alexa app in their Ford car), voice shopping is predicted to be a $40 billion market by 2022. That’s up from just $2 billion today. It could be used by media companies for on-going, or one-off, subscriptions, memberships, micropayments, downloads, or access to exclusive content. Either way, this is an emerging vertical which – like voice technology per se – that cannot be overlooked. Although the eCommerce functionality of this technology remains relatively nascent, companies like CNBC are exploring more traditional advertising packages, such as sponsorships, on these platforms. Screen-less, voice-only platforms, will not only represent a very different way for consumers to find information online. They will also disrupt a number of traditional online advertising models too. This technology is still relatively nascent, but it’s playing out against a wider background whereby voice technology is becoming increasingly integrated into our lives. 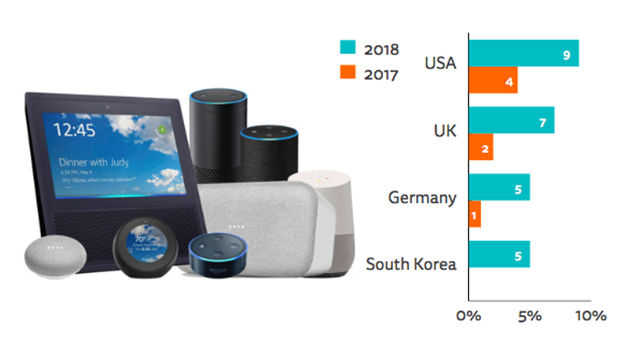 And, in case you’re not yet convinced that the voice market merits your attention, keep in mind that this trend is global and impacting devices of all kinds. Alibaba sold 1 million Tmall Genie X1 smart speakers in the last four months of 2017, a device they plan to install in 100,000 Marriott hotel rooms across China. And closer to home, Roku TV’s will soon feature built in voice assistants, while Dish already allows you to search and surf for content using voice functionality in their TV remote control. In the era of the Internet of Things, domestic appliances – such as those from Whirlpool – can already be managed by Amazon Alexa and Google Assistant. Undoubtedly, voice technology will become all-pervasive. In November, Amazon announced Alexa for Business, “a new service that enables businesses and organizations to bring Alexa into the workplace at scale.” This is just one way that voice-triggered activities – from search through to content discovery and shopping – will move out of the home and into the office and car. Voice search and screen-less content consumption are areas that are already beginning to take off. And this trend will increasingly impact media and information habits in the future. As a result, understanding the potential – and pitfalls – of this technology is an area that brands and publishers need to be exploring, if they aren’t already. Consolidation across the media continues in 2018 as does business decentralization according to the Future Today Institute’s 11th Annual Tech Trends Report. This year, the Institute identified 225 trends and examined how these changes and new technologies might impact the marketplace in 2018 and 2019. Natural Language Generation (NLG): a processing task where computers generate the language humans use in a different situation. NLG can rewrite content for all different types of readers. News organizations can create different versions of the same story for different audiences based on educational and reading level. The facts (data) remain the same but the vocabulary would be modified based on each of target audiences. Computer Assisted Reporting (CAR): an investigative journalism technique. Reporters find public records and documents to mine. Using machine learning algorithms can analyze the data to help find hidden storylines. Voice interfaces: Siri, Google Now, Amazon’s Alexa and others will soon offer more than one set of facts and opinion on a topic. There is emerging research into using voice interfaces to help professionals understand different sides of a discussion or argument. Audio search engines: These are essential as podcasts continue to grow in popularity especially as a new platform for news commentary. Several companies are working to off audio in a searchable manner. Niche publications, podcasts and digital content and AR: Augmented Reality integrations are expected soon in these different content offerings. Software as a Service: in this licensing and delivery model, users pay for on-demand access. Offering access to systems that automatically generate reports using news organizations’ archives and databases can create a new revenue stream. Immersive storytelling: Storytellers started producing stories built specifically for immersive environments. Publishers are experimenting now with POV storytelling templates and story formats specifically developed for new technologies. Fake news: While Facebook and Twitter promise to curtail bot-generated content operations on their platform, fake news continues to spread. Unfortunately, in 2018, little success is anticipated. In fact, as social media companies experiment with improved ways to stop the spread of fake news, more problems and potentially more fake news stories continue social platforms. Limited-edition news products: these offer an opportunity to provide audiences with temporary podcasts, newsletters, chatbots, and text messages about topics like weather events, big sports games and elections. They also provide a unique opportunity for revenue, audience engagement and data collection. Historical preservation: Efforts to protect and safeguard historical digital news records are growing. Identifying the policies for record retention and backups needs to be addressed as an industry. Several of the trends identified suggest new opportunities to drive change and increase revenues. Publishers that lean in to these possibilities can transform trends into growth. A December 2017 survey by the Pew Research Center found that 46% of Americans use digital voice assistants, and the trend is going up. A recent study from Juniper Research forecasts that 55% of all households will have a smart speaker installed by 2022, and marketers’ spending on such assistants is expected to reach $19 billion by the same year. It’s a huge opportunity for marketers and publishers looking to reach audiences on these devices. But buying an Amazon Echo, Google Home, or Apple HomePod isn’t just buying a product, but inviting an entire company into your home. So, publishers should tread with caution to make sure they have a fair shot in sharing upside, without upsetting people with invasive advertising and pitches. It’s a no-brainer that as Amazon, Google, and Apple rev up their products, they’re also going to look for ways to monetize their use and increase their company footprints. As the battle between platforms and publishers plays out, publishers must bear in mind that digital voice assistants are no exception. Not to be outdone but admittedly late to the game is Apples’s new HomePod device and Sonos’ new voice-activated speaker, Sonos One, which presents itself as a platform-agnostic device. But you’d have to do the legwork yourself to transfer your personal data, should you switch from one platform to another. And that means that the platform buy-in is real. Amazon has a two-year leg up over Google and is obviously at the top of the hierarchy at the moment; it also has the potential to upend the entire advertising industry. What was once a company that tiptoed around marketing has now been toying more with placing sponsored products higher up in search results — which means advertisers are now buying in more. To date, Amazon says it won’t sell advertising on Echo, but advertisers and the public assume the company will change course when it figures out the best way to serve them. Google, meanwhile, is pushing its Assistant onto more products, and made a huge splash at the recent Consumer Electronics Show in Las Vegas. It recently came out with “Smart Displays” (akin to Amazon’s Echo Show), which, among other things, can visualize recipes, maps, and — to toot on its own horn — YouTube videos. It’s no wonder that marketers are trying to benefit. The natural question for brands now is how to bring voice into their experiences, which is in sync with how companies are also trying to differentiate their products. You can see how that plays out with Apple’s “give me the news” feature on for Siri, or the number of brands building skills for Alexa, which Amazon also touts as device features. The BBC has been relying on voice assistants installed on smart devices to feature BBC content, and will likely transition into creating content specifically for Echo and Home devices, and monitoring what and how people are listening to create better experiences for those voice-activated formats. The Washington Post and CNN, among others, are also experimenting with ways to leverage audio programming in a way that’s useful for their audiences. With more devices entering the market and voice positioned to be the next frontier in experience and marketing, the risk for publishers is that building for one company specifically — or even multiple companies — places their eggs in the basket of a third-party tech giant. That means that as bullish as publishers ought to be in featuring content where their audiences are, they also need to insist on sharing the wealth these tech companies are gathering — revenues, customer data, advertising insights and more — to beat any potential exploitation. And that can also be an opportunity for publishers. The current trend is still on the we-must-get-on-the-voice-AI-bandwagon-before-it’s-too-late hurried strategy, without thinking about the data and revenue deals that need to happen in tandem. With all the opportunities publishers can leverage with voice — news flash briefings, news quizzes, podcast streaming, recipes and the like — they should also emphasize their own loyalty programs, subscriptions and original content back on their own sites. Just as publishers have battled with social platforms over the power dynamic, data and promotion, they will have to make sure voice devices don’t end up using their content without giving them a good chunk of the spoils when they take off. Amazon Echo Show, Alexa, and Google Home have been positioned as the next big thing for companies and consumers. Content companies, marketers, and advertisers have scrambled to get up to speed on the technology behind them and are actively trying to figure out how to incorporate them into their planning. Certainly, there are a slew of companies anxious to get in on the Internet of Things (IoT) home automation game. However, they all realize that what will make them the most money is delivering their messages on the home automation system that reaches the most number of households. Nevertheless, home automation is a new game with a whole new set of rules. The winner of this space will be whomever can master a very different skill set: providing subsidies through tax credits and insurance claims, and developing tight relationships with residential and commercial general contractors. 1. It’s too expensive: To get the full effect of the IoT transformation, a homeowner would have to replace every appliance in their house. That includes everything from the garage door, the thermostats, and doorbell to every light bulb, roof, pool pump, possibly even an entire music library, and more. Not many will be able to afford this.To reach mass adoption, someone else will have to pay for it. But who? Using smartphones as an example, they didn’t hit mainstream until carriers helped subsidize the cost of the phone by rolling it into the service plan. Similarly, broadband effectively crossed the chasm when it started getting bundled by default with TV and phone service. Providers and appliance companies need to figure out a way to subsidize the cost of every upgrade. This can be accomplished through tax credits and subsidies for environmental upgrades or through insurance companies willing to foot the (partial) bill to replace elements of the home due to age and wear-and-tear. 2. Integration is too difficult: Seamless integration is another major obstacle to the adoption of home automation. Setup is prohibitively difficult. Many products won’t work together because they’re made by competing companies. Users often are forced to use separate apps or hubs for each appliance. Thus, whichever company can offer a full-package solution has the best chance of solving this integration problem. And whichever company has the capacity to work closely with residential and commercial general contractors will have the advantage since selling a “full package” is only financially realistic when rolled into the mortgages of new-build homes. There’s a domino effect here since the solar roof you choose will require a battery store, and that battery store will work best with the related fuse box, which might act as the control hub to the rest of the house. This, in turn, will determine most of the other appliances, such as wall switches, light bulbs, thermostats, ceiling fans, etc. One may argue that there is already a company set up to dominate the home automation market, which already has cachet with consumers, and is both full of shine and substance. Tesla is the only major tech company making it an integral part of their business to embrace the complexities of insurance companies and residential and commercial general contractors. This is necessary for them to drive adoption of their Solar Roof. They are also already masters of helping consumers with government subsidies that come with environmental tax credits from buying their cars. These are the types of moves needed to, gradually over 20 years, deck out a house, top to bottom, with a seamless, consistent, single-vendor solution that was paid for by rolling it into standard maintenance costs or mortgages. There’s another reason why the winner in home automation won’t be one of the usual giants in consumer tech today. This will be unfamiliar territory for them since they focus on glamorous consumer electronics rather than practical products meant to last a generation of home ownership. Apple will miss the boat by trying to “design” their way to success. But let’s face it: Home appliances are not “objects of desire” like jewelry. Amazon will try to reach success by slashing margins but “cheap” is still more expensive than subsidized. Google will try winning by having smarter devices than their competitors but most devices only need to be smart enough to turn themselves on or off. For now, it’s a dream state as we wait to see how home automation can work together for an entire household in a way that’s not cost-prohibitive. It must also be seamlessly integrated into the home. Until these hurdles are “solved problems,” home automation—and the opportunities that come with it for content companies of all types—simply cannot cross the chasm. Rylan Barnes is the co-founder of ShopSavvy, one of the largest shopping/deals apps, that is part of Purch’s portfolio of brands, and Vice President of Software Engineering – Mobile and Emerging Platforms at Purch.